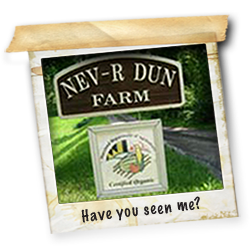 Nev-R-Dun Farm offers 100% certified organic products and have been Maryland certified organic since 2001. Directions: The farm is located at 2439 Hughes Shop Road, which is about 5 miles northwest of Westminster in Carroll County off of Rte 97 north. © Copyright 2019 Nev-R-Dun Farm. All Rights Reserved.